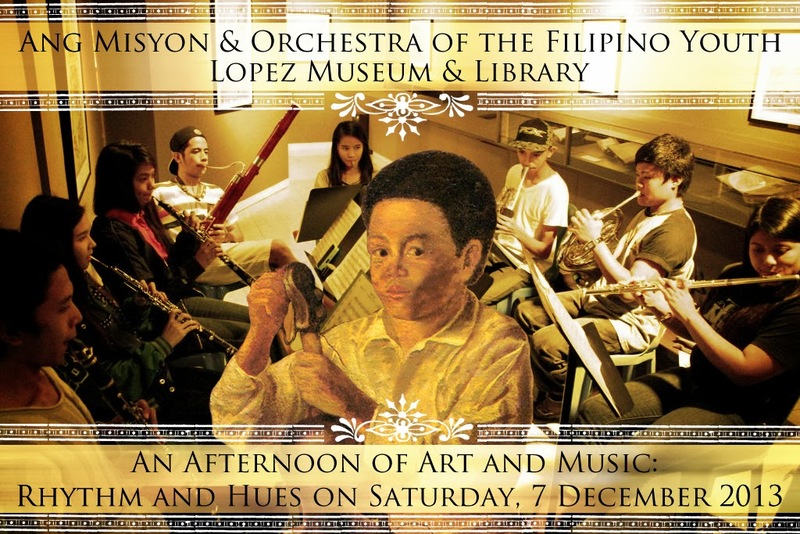 Don’t forget to spend an afternoon filled with music and visual arts with Ang Misyon and Lopez Museum and Library’s Rhythm and Hues on Saturday, 7 December 2013. Guests will be given guided tours of Lopez Museum’s current exhibition, Trajectories, every hour starting at 12 nn. Concert by musicians of Ang Misyon and members of the Orchestra of the Filipino Youth will start at 3 pm and will be held at the Benpres open space. Repertoire will include a selection of Filipino, Jazz, Contemporary, and Christmas music. OFY is a joint venture between ABS-CBN Corporation and First Philippine Holdings. Ang Misyon established OFY along with its after-school music education program, Sistema for The Filipino Youth, which offers children from deprived communities the opportunity to achieve their full musical potential through Classical Music performance, with the ultimate hope of creating a positive impact on their communities. The Lopez Museum and Library’s exhibit Trajectories showcases the highlights of the museum’s collection featuring Filipino Old Masters Juan Luna and Felix Resurreccion Hidalgo, conservatives Fabian de la Rosa and Fernando Amorsolo as well as works by modernists Victorio Edades, Nena Saguil, and H.R. Ocampo. Ticket costs Php 500 and includes the concert and admission to the museum. Ticket will be valid on the day of the concert or any other day until 20 December 2013. For more information and reservation of tickets, contact Tina Modrigo at 631-2417 or email lmmpasig@gmail.com.